For people in parts of Carpentaria and Gregory districts. Issued at 9:22 pm Saturday, 9 February 2019. SEVERE THUNDERSTORMS SOUTH OF THE TOP END. 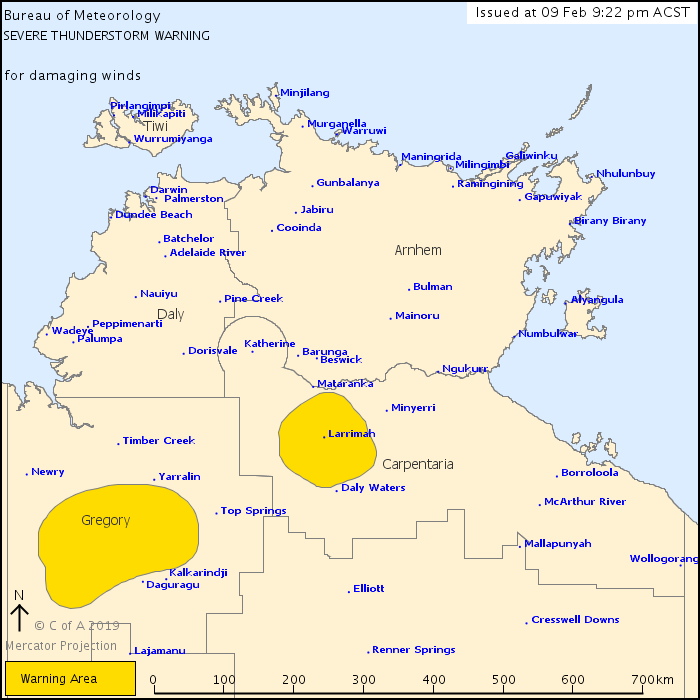 Weather Situation: Severe thunderstorms have developed along a trough to the south of the Top End and are moving towards the north northwest. Severe thunderstorms are likely to produce damaging winds in the warning area over the next several hours. Locations which may be affected include Larrimah. An 82km/h wind gust was recorded at Daly Waters at 8:58pm ACST.